Bumpy, green, maturing to yellow skinned citrus fruit with a highly acidic flavor. The leaves are an important flavoring in Thai and other southeast Asian dishes. Small tree, from 6-25ft in height. 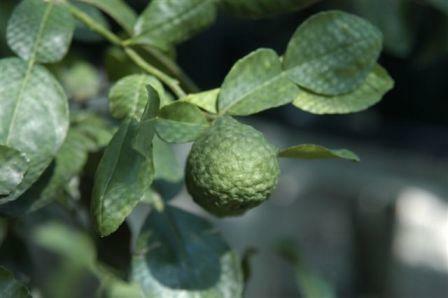 The Kaffir Lime is easily distinguished by its glossy, two-part leaves. Trees also usually contain some thorns. Trees are mildly frost hardy and grow best in areas that receive only short, mild frosts. Grow in full sun, provide water during growing months and protect from hard drou hts. Fertilize at tthe beginning of growing season.